The extravagant users…if they are getting the same utility as the lowest users – having the same sorts of experiences, then why do they need all these things? Oliver Bates is a PhD candidate at the Lancaster University School of Computing and Communications. 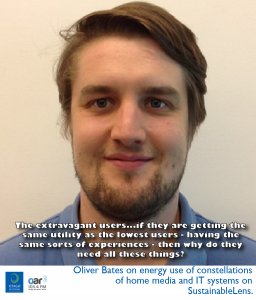 Oliver’s research focuses on understanding energy impacts in the home for which he uses using a mixed method involving lots of sensors and lots of talking and listening. He presented a paper on this work at CHI 2014 called “Towards an holistic view of the energy and environmental impacts of domestic media and IT“. Ecofeedback is not particularly successful in reducing energy consumption – somewhere around 5 and 15%. What are people doing and how can we do it differently? People design new things and people buy the new things and people use the new things, it’s a self fulfilling energy growth. If you charge a phone for two hours at 6 watts, that’s nothing compared to a laptop at 50-60W for 8 hours. Longevity, across anything is more important, especially for high impact devices. If a thing has high embodied impacts and it has a higher electricity demand, at what point do I go, ‘this devices uses way too much electricity and I’ve had it for a while, I should buy a more efficient thing, but therefore releasing more carbon’? (Finding the sweetspot) calculate the embodied emissions, whichever method you want, you need to then know the times of use – say a laptop you charge 8 hours a day, using 50W across those hours…for me I want the direct energy to at least be greater than the embodied impacts. I don’t want something to be created before I’ve matched its emissions – that feels like a waste, I don’t know why. Double the impact maybe, getting your impact’s worth. The numbers on the life cycle impact vary hugely according to the method (cost, weight etc) and how deep you go in the analysis. If I say “I can reduce my impact by replacing all my media and IT devices with new ones that are 15% more efficient” then that is a completely misinformed decision…you’ve bought a whole new thing creating 1000s of kilograms of CO2 in the atmosphere just because you can save 15% per month in your energy bill – that is a bad decision. I don’t think there are obvious rules of thumb. That’s part of the problem with ecofeedback, it’s not like a blanket rule you can apply. People make choices…the smallest user was 164Wh, the largest 4135Wh…about 40 times more impact for pretty much the same experience. The two largest two consumers used 40% of the total consumption, which is huge and they did have large inventories, but in the middle the variation comes down to times of use and not leaving stuff on. (the bang for the buck comes from addressing the top users). But needs context. Consumption was a product of how they configured their things. If these people can it it this low impact way and be happy, then how do we get that message to the high impact users, especially if they don’t care? I don’t want to be the guy the guy that says “you need to throw out all your stuff”. Extreme policy but may be we need to be extreme sometimes, if we are trying to get from 15% to 65% energy efficiency then maybe that’s the radical steps we need to push for. Advice: Discuss how you do things at home…acknowledge that (other people) get on just fine by having a ‘lesser’ quality of experience, but it’s OK…maybe we can share. I like the idea of sharing but I also like the idea of my own space and my own stuff.